They say size doesn’t matter, but when its your email signature size, it not only matters, but costs your company more than you think! We’ve wanted to write this post for quite a while, but have always run out of time (made excuses), and just never got around to it, until today! The size of your email signature is just as important as the style and design. Yet, it often gets forgotten/overlooked. Gimmio follows all best practices with email signatures, so if you’re serious about creating an email signature that is small in size, make sure you try our app. If you don’t have time to read this whole article, we don’t blame you, just read over the key issues and our recommendations below. Using a large email signature could cost you upwards of $25,000 for any future mail server migrations. The additional electricity used by having a large (45KB) email signature in a 500 employee organization is 70.57kWh/year. Large email signatures use more ink/toner and more paper space, which directly impacts the environment. 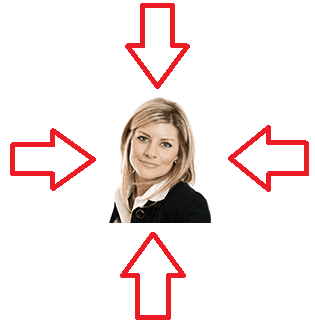 If you use images in your email signature, make sure they are compressed thoroughly (we cover this in detail later). If you must use banners, make sure they are of a reasonable size (again, covered in detail later). Use your full email signature only when sending external emails. You wouldn’t distribute the majority of paper advertisements to staff members so why should email signatures be any different. You can often set up internal emails to use much smaller text-based email signatures. Simple, text based email signatures started appearing in the late 90’s. They have evolved from simple digital business cards to a powerful advertising medium. Modern email signatures should be a tracked and tested method for marketing your products or services. The downside of text-based email signatures is that they don’t convey professionalism, they can’t be tracked, that they can’t utilise calls to action and they won’t convert as many customers compared to HTML signatures. That being said, HTML signatures also have some downsides if they aren’t created carefully. Just so you know the difference between a Text-based and HTML-based signature, here they are. In order to easily show the different effects below, we need to create an example situation that we can use. Let’s say we have a company that has 500 employee’s, each with an email address. It’s a professional company where every employee uses email on a daily basis. They all use the base company HTML email signature, that includes their logo along with text which describes their position, address, phone number etc. They use their full email signature for internal and external emails. Each one of the employees sends 32 emails per day based on this average. That means, collectively they send around 16,000 emails per day. The server has a RAID 5 array for hard disk configuration with 6 hard disks installed, which means it uses an additional 20% storage space for redundancy. The uncompressed example email signature that we will use is 45KB. The compressed example email signature that we will use is 22KB. This is based on real-world figures of email signatures we see on a daily basis. One of the biggest (and often unseen) problems of large email signatures is that they grow the mailbox databases to very large sizes. Although this might not bother you right now, and you may just keep purchasing more hard disks for your server to cope with the load, it will likely cause you huge headaches in the future when you are migrating your mail servers to another platform. Which IT company is doing the migration – Will they quote per user to be migrated, per user and size of the mailbox, or just for the size of the database in total? Will they use tools – Will they be doing the migration manually, or use tools that will speed up the process? Doing it manually will take more time and will cost more. We can estimate fairly accurately as we’ve owned a successful IT company that has done many mail migrations. Most IT companies will quote on the user count, but will also take into account mailbox sizes at the same time. $125.00/User – If the user mailbox is under 2GB in size. $175.00/User – If the user mailbox is 2GB – 5GB in size. $225.00/User – If the user mailbox is 5GB – 15GB in size. Based on the 500 employee company example, if all the mailboxes are under 2GB in size, the cost would be $62,500. If the mailboxes are all over 2GB in size, the cost of the migration is $87,500, which is a difference of $25,000. Although there are many variables involved, this will give you an idea of the additional costs you could face if you use a large email signature for your company. Based on the example situation above, this is the data usage comparison of the 2 email signatures. 45KB Email Signature (Uncompressed Images) – All these emails will use around 720Mb of server hard disk space each day. 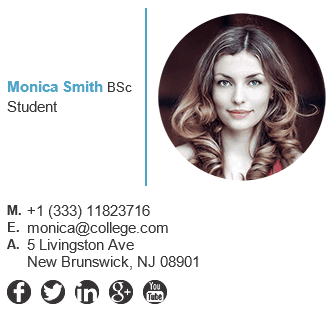 22KB Email Signature (Compressed Images) – The compressed version would use around 352Mb of server space per day. This is a difference of 368Mb per day if you don’t use an optimized email signature. Over a year, that is an additional 134.32GB of disk space that you are using on your mail server(s). When you take into account the increased storage space needed for your backups and add the RAID5 overhead of 20%, the total additional space used becomes 322.36GB. You might ask yourself, why would sending emails use up disk space on my server? That is because your server saves all your sent items so you can later refer to them. A typical server hard drive costs around $300-$350 USD for 600GB, which is about $2 per GB. This is the lowest price range for hard drives you can buy for servers. Some hard drives cost in excess of $1000 USD for the same size. Taking all this into account, it will cost you an additional $644.72 per year in hard drive space alone if you use an unoptimized email signature. The additional electricity used by having a large (45KB) email signature in a 500 employee organization is 70.57kWh/year. This estimate is based on the power consumption of a 600GB 15K RPM HDD which is 15.2W at full load. Since 322.36GB of our example HDD is used, we use a loading factor of 53%. The estimate for our example company’s additional yearly electricity cost incurred for unoptimized email signatures is $8.46. This is based on an average cost of electricity in the USA of 12c/kWh. Larger databases usually mean slower databases. It is a well-known fact that when you grow a mailbox database to a large size, it often slows down for the end users because of having to index all the data. Although you can create multiple databases to spread the load, this takes time and also requires additional IT resources. All of the information above that we have presented about server and environmental impacts would also be happening to your recipients when you send them large email signatures. Just like your mail server stores sent emails, the recipient’s mail server stores received emails. So, by having a large email signature, you aren’t only creating a problem for yourself, you are also creating financial problems for your recipients too. The bigger your email signature size, the longer it takes email clients like Outlook to open and render your email. When you open an email with a large email signature, it will often not show any images for the first 5 seconds. This happens because your email client is trying to download the signature resources from the internet. If the images are big, it will take longer to download. Sending data through the internet costs money. You often pay your ISP a monthly fee, and in return, you get a certain amount of data that you can download and upload per month from the internet. We won’t take this into account, as there are too many variables, such as average cost of internet, the data allowance, the percentage of emails sent externally that use the internet for the transfer and a few more. Although this cost is likely minuscule in comparison to the others, it’s still worth mentioning. When people make email signatures, they often only concentrate on the look and feel of the signature, and rarely on the size. Although the design of the signature is very important, the size is just as important. Let’s dive right into it and discuss how you can make your email signature as small as possible. Compress All Images – This is one of the most important points to note when trying to reduce your email signature size. Whenever you have any images in your HTML signature, make sure you compress them using tools like tinypng.com. This tool is free, and it makes your images much smaller in size (KB) without losing any quality (lossless compression). Would you rather have an image in your email signature that is 50KB, or an image that is 13KB and looks exactly the same? We know which one we would rather have. 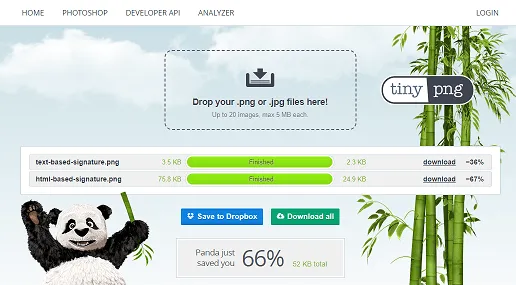 When you go to the TinyPNG website, simply drag and drop your photos into their website, wait a few seconds, and they are done. You can then download your compressed images. Use Small Images – One of the best ways to dramatically drop the size of your email signature is to simply use smaller images, in terms of resolution. Smaller images not only look better in signatures, but they also take up less room and most importantly, are smaller in size. Don’t forget, even if you use a smaller resolution image, you should still compress it. Don’t Use a Banner (unless you have to)– Banners are just larger images which span the bottom of your email signature to give an additional message to your recipients. Banners are a great way to promote your company or advertise products, but they take up a lot of room in an email signature. The size of them is often huge and places unnecessary load onto a server if the whole company is using them. Like ordinary images (logo’s, face shots etc), you can use TinyPNG to losslessly compress your banner image to make it smaller. You could speak with your marketing team to ask if you need to use a banner. Only Include Important Information – This is fairly self-explanatory. Use only the information that the recipient needs to know. Only Use PNG, JPEG and GIF Image Types– The best image types for logos are PNG. If you want to use a face shot with complex colors, use a JPEG. GIF images can also be used for any simple one or two coloured images such as social icons. If you are sending internal emails to your colleagues, do they really need to know the name of your company and the logo? They also don’t need to see the disclaimer attached to every single email. You should only use your full HTML signature when you are sending emails external to your company. When sending internal emails, use a basic text-based email signature. Depending on your company policy and how long you are legally required to keep your company emails, you could set your mail servers to automatically delete emails after a few years. This will help keep your mailbox databases smaller. If you have recently followed this article and made your email signature smaller, you could use this method as a way to remove all the excess data that the signatures are taking up after a few years. We know that sometimes you have no choice but to print an email, but make a habit of thinking about the environmental consequences of printing the email. Think twice about whether you actually need to print the whole email trail of 50 replies, just to read one sentence out of it in a meeting. If you use an email signature that is bigger, it could be cut short when viewed on a smaller resolution device, such as an iPhone or Android. Remember, you should always set the images to be 96DPI. Banners are often the biggest contributors to large email signatures. After years of making email signatures, we have a good idea of signature sizes and how quickly they can grow. 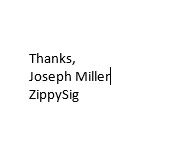 We often get customers from large enterprises email us asking to re-create their corporate email signature using ZippySig. One of the first things we look at is the size of the signature. More often than not, the sizes are over 40KB and sometimes up to 70KB, which can be a huge drain on company resources. The same email signature, when re-created with ZippySig, and with the images compressed, will often be around 20 – 25KB in size. The average size of an email signature created with Gimmio is around 22KB. This includes the images (compressed) and the HTML code. Although there are currently no studies available that document the worldwide average size of email signatures, we predict it would likely be around 45-50KB. However, we came to that figure only based on the thousands of email signatures we have seen over the years, and haven’t conducted any study on the subject. Based on our findings above, we can confidently say that large email signatures have an impact on mail migrations, IT infrastructure, the environment, and are costing companies money. There really isn’t any need to have an email signature that is more than 25-30KB. Do your part for the world, reduce the size of your email signature! If you’ve read this far, congratulations for reaching the end and thank you for reading our thesis blog post. As always, if you want to make an amazing email signature (that is small in size), feel free to try Gimmio. Thank you for this very interesting article. I am glad that you mentioned the environmental impact, as well as the cost. Although it is hard to accurately quantify the environmental impact, there definitely is an impact.